On Sale Now! 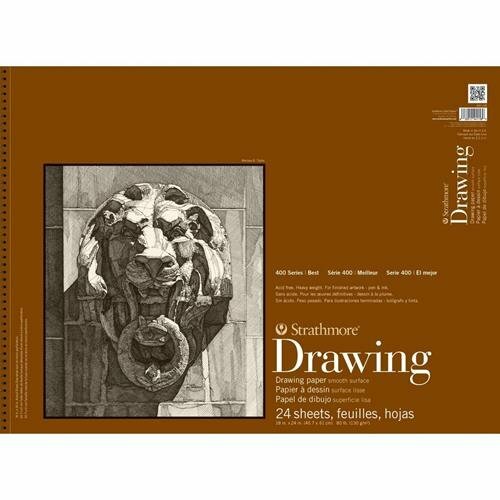 Save 6% on the Strathmore 400-108 400 Series Drawing, Smooth Surface, 18''x24'' Wire Bound, 24 Sheets by Parrot at Designers Artists. MPN: ST400-108. Hurry! Limited time offer. Offer valid only while supplies last. Pro art-Strathmore smooth surface drawing paper pad. A heavy-weight paper with a smooth surface ideal for mastering pen and ink drawing techniques. Pro art-Strathmore smooth surface drawing paper pad. A heavy-weight paper with a smooth surface ideal for mastering pen and ink drawing techniques. This package contains one 18x24 inch spiral bound drawing pad with twenty-four sheets of 80lb acid free drawing papers. Made in USA. This item is manufactured in United States. View More In Drawing Paper.